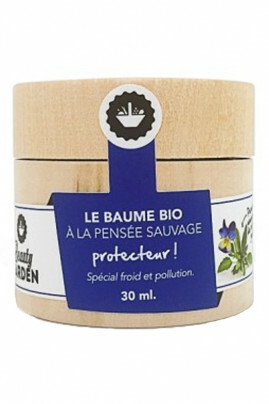 Beauty Garden Organic Protection Balm with Wild Thought acts as a protective veil for 24 hours! It protects the skin from external aggressions (wind, cold, atmospheric pollution ...) and gives it the necessary comfort for the whole day. Composed of natural active ingredients including organic wild thought, this treatment soothes and deeply hydrates your skin. Its melting texture penetrates instantly and offers you a cocooning moment, very pleasant at night! Bring softness and protection to your face with the Organic Protection Balm Thought! Ideal for all skin types and especially sensitive skin, prone to redness and tightness. How to apply Organic Protection Balm Beauty Garden ? Solid texture, it melts to the touch and diffuses its benefits from the application. To use it, melt a hint of organic balm with your finger. Apply on sensitive areas of your face such as the nose, cheeks, forehead and chin. This protective cream is to be applied in the evening before bedtime. To complete the powers of this balm and bring a firming action, we advise you to apply the Beauty Garden Organic Relaxing Face Balm on the contour of the eyes and the lips. As a result, you wake up with refreshed, protected skin for the whole day! A soft and protected skin with natural and organic ingredients!